Generally, safety glasses that you can buy without prescription usually protect your eyes if you wear contacts or don’t need glasses. These glasses usually wrap around your eyes to form a shield against the elements. Make sure to buy glasses with lenses made of polycarbonate, which is the strongest lens material available. Glasses for safety and tactical purposes are specially designed and have several important features. The most important feature is that the frame has an ANSI Z87 safety rating. Don’t buy any glasses that don’t have such a rating. Some frames use padding on the frame around the eyes, which cushions the frame on your face and protects your face upon impact, while others often include soft silicon pads around the nose, which also help to keep the frame in place. Frames may be made out of several different types of materials, including various metals and titanium, plastic and polycarbonate. Polycarbonate lenses are extremely resistant to impact, and also give a lot of “bounce back” and “blow back” protection. However, there are other materials for safety lenses that are alternatives to polycarbonate that can be made to meet safety thickness requirements. Some tactical frames come with interchangeable colored lenses to use when facing varied conditions of light. Orange or yellow colored lenses block blue light as well as haze and provide a more vivid hue of orange, which is often the color of the target. Bright yellow lenses are good for using in low light, or foggy weather conditions. A light purple lens is particularly good for seeing an orange target when the background is green trees. Vermilion lenses help you see where there is a natural outdoor background, and helps the target to stand out. If you prefer a neutral or natural color, gray is the color of choice. A gray lens allows you to see all colors naturally, and are good for using in strong sunshine. 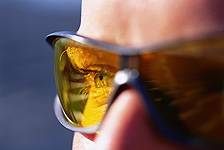 Polarized lenses are good for use in the outdoors, as they reduce glare, and particularly near water. The ANSI Z87.1 standard was most recently updated in 2015. These updates focus on product performance and attempt to harmonize with international standards while keeping the needs of end users in mind with consideration to workplace hazards and regulatory obligations. The following video from Edge Eyewear does an excellent job demonstrating the different tests performed on safety eyewear. After seeing how badly non-safety-rated eyewear fails these basic tests, you’ll only want to purchase ANSI-Z87.1 rated eyewear. All safety markings for ANSI Z87.1-2015 safety eyewear must be permanently and clearly marked on the frame or lens. This marking requirement includes goggles and face shields as well as safety glasses.